Chatbots have been around for some time now. This brand new technology is taking its swing and almost all enterprises and larger business organizations that have a large number of customers are starting to recognize how beneficial these solutions can be for their organizations. Brands can utilize chatbots to grow further and improve their customer service drastically. You can recognize the trend is growing by the fact that Facebook has implemented chatbot options for pages that want to use them. However, there are certain difficulties with Chatbots. Businesses need a design of their own and they want to implement their chatbots the way they see fit, in order to get the most out of it. This usually meant that you would have to hire developers to build your chatbot from scratch until SnatchBot appeared with their own solution. First of all, you need to understand that SnatchBot functions as a platform as a service. This means that you won’t have to install anything or wait for “experts” to come and set up everything so that you can start using it. No, the only thing a user has to do is go to SnatchBot’s website and log in to start using all the features and functionalities this bot building platform offers. The only thing separating users from starting the process of creating their own chatbot is the registration process on the official website. This only takes a little bit of the user's time and you can log in with Google+, Facebook or proceed to register via email. In just a couple of minutes, any user will be able to start working on the SnatchBot platform. This is a truly revolutionary approach for chatbot implementation. The whole starting process is quick and easy and everyone will be able to understand how it works. 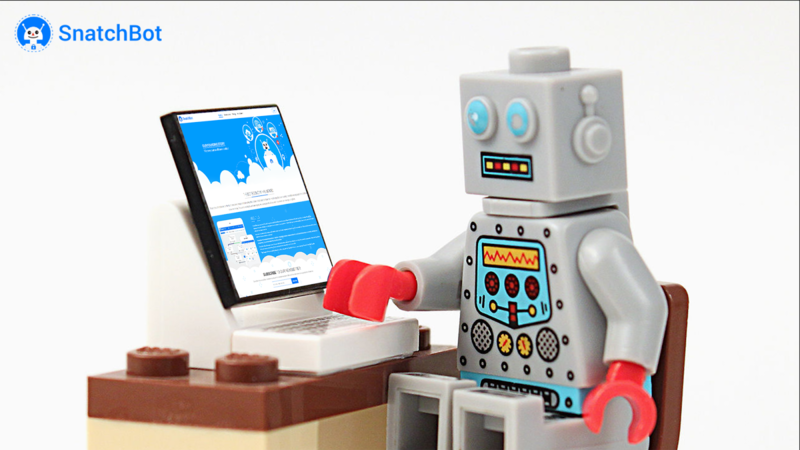 When a user has finished the registration process, he or she will be directed to the dashboard where they can start working on a new chatbot. The dashboard that pops up after you’ve completed their login is the place where all the magic happens. On the left hand side, a user can see all of the things that he or she can do within the dashboard. The “build” option is where you start creating your brand new bot. The “my bots” card offers a clear overview of all the bots you’ve made and how they are performing. This is a great feature through which you can learn how to adjust your bots and see what kinds of designs are working better for you. You even have a full “reports” card where you can generate reports when needed to share information about your chatbots and their performance. The whole process is designed to make things as simple as possible. All of the commands and options are presented logically and customizing your bots almost seems like a video game and not some serious business process. And this doesn't mean sacrificing depth. Users are able to create comprehensive solutions that will help their business.